Rojgar Bharti Melo In Ahmedabad Gujarat State : 30-01-2018 @ employment.gujarat.gov.in. 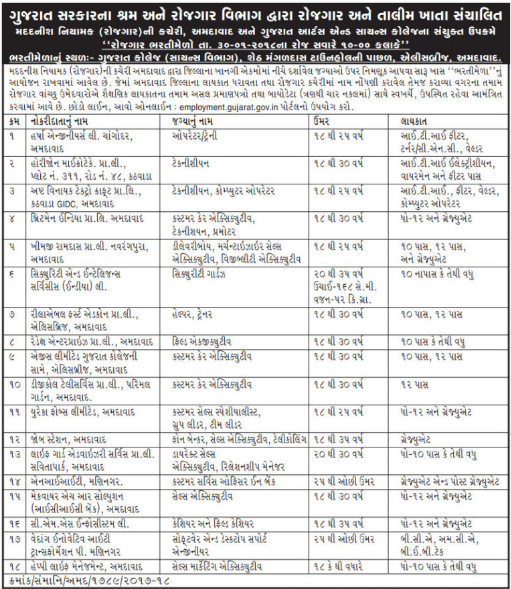 Employment and Training Department Ahmadabad has published Advertisement of Rozgaar Bharti Mela for below-mentioned posts. Check below for more details. Employment and training center stated in Ahmadabad district published advertisement of the rojgar bharti mela. Here is the detailed advertisement which was published in news paper. Education : Please refer Official Notification for Educational Qualification details. The official notification of this Ahmadabad official notification is in Gujarati language. Selection Process: Candidates will be selected based on an interview. the place of interview is given below. How to Apply for This Bharti mela? place of interview of rojgar bharti mela : Gujarat Collage, Science Department, seth mangaldas town hole in pachal, alice bridge, amdavad. ѡorld all is available on net?